Do I Need Duct Sealing Every Year? Rattling sounds from the ductwork when the heater comes on. Much higher heating (and cooling) bills than normal. Musty and moldy smells from the vents. Uneven heating, with rooms colder than normal. Any of these could point to different repair issues in the HVAC system, and leaking ducts are one of the most common causes. Duct testing from professionals will find out the state of the ducts and if they need sealing. We also recommend testing the ducts every few years even if you don’t notice warning signs. Ducts with air leaks create problems around the year, no matter if you’re using your heating system or air conditioning system. The ductwork of the ventilation system is supposed to have an airtight seal along its length to maintain air pressure. Breaks in the seal drop air pressure and allow already heated air to escape into closed-off parts of the house where it doesn’t do any good. Better comfort: Imagine warm, cozy air coming from your furnace that heads through a duct passage to a bedroom. But on the way, leaks along the metal, plastic, or ductboard of the ducts allows 30% of the heated air to escape. Around a third of the heat intended for the room ends up going nowhere. As a result, the bedroom feels drafty and colder than the other rooms. The more leaks around the ventilation system, the more cold and uncomfortable the rooms. When the ducts are sealed, the house will be heated the way it’s supposed to be. Energy savings: If 30% of the air you’ve already paid to heat never reaches the rooms, that’s money wasted. The heating system must work longer to make up for the loss, and you’ll see the difference on your energy bills. You don’t want to pay 30% more each winter to warm up your home! Seal those ducts and you won’t have to. To arrange for duct sealing in Madera, CA or elsewhere in the Central Valley, call us! We’re not only an HVAC repair contractor, we work with ductwork design and construction—we know the best ways to repair damaged ducts in a home. 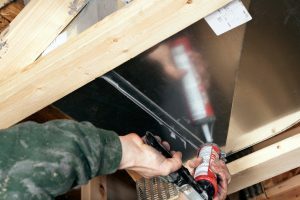 Seal those leaky ducts before winter! Purl’s Sheet Metal & Air Conditioning: Quality Is the Cornerstone of Our Success Since 1952.